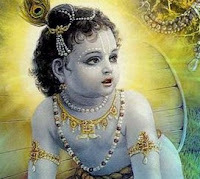 Krishna Janmastami - August 22, 2011! ~ The Toronto Hare Krishna Temple! Krishna Janmastami - August 22, 2011! On Monday, August 22, 2011; the Hare Krishna Temple (243 Avenue Road - click here for a map) will be celebrating the biggest birthday party of the year, Lord Krishna's appearance day - Sri Krishna Janmastami!!!! The evening program will be full of kirtan, bhajans, discourses and more! The highlight of the evening is the countdown to midnight! The momentum builds as the abhisheka (bathing ceremony) is performed and the Temple is filled with wonderful rocking kirtan, at the stroke of midnight, the Deity doors will open and their Lordships Sr Sri Radha Ksira-Chora Gopinatha will be revealed in a stunning flower outfit! It is truly a festival NOT to be missed! Please note, prasadam (vegetarian feast) will be served in the dining hall from 7:00 pm onwards. The full feast will be served after midnight. Free street parking is availabe on Roxborough and Macpherson streets between 6pm and 12am. Extra paid parking is available for festival attendees. The parking lot is located on Pears Avenue, a 2-3 minute walk from the temple. Click here for a detailed view. A schedule for the eventful day will be up shortly. Please stay tuned! Sri Sri Radha Kshirachora Gopinatha ki JAI!!!!!!!!!!!! !